Maintaining the integrity of the world’s critical infrastructure depends on industry recognizing risk and better protecting every aspect of industrial control systems that make them vulnerable to cyber attack. 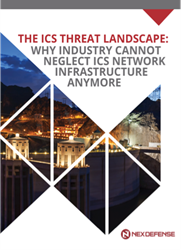 NexDefense Inc., a leading provider of cybersecurity for industrial control systems (ICS), today announced the release of its newest whitepaper, “The ICS Threat Landscape: Why Industry Cannot Neglect ICS Network Infrastructure Anymore.” The whitepaper is available for free download by visiting: http://www.nexdefense.com/learn-more/white-papers/the-ics-threat-landscape/. Historically isolated, both physically and virtually, ICS that operate critical infrastructures (e.g. power, water, chemical & refining, transportation, manufacturing and a host of other essential sectors) were designed to last for upwards of two decades and independently perform the same function for the entirety of their lifecycles. With safety and reliability traditionally the top two priorities, the majority of resources were given to the personnel who needed to fulfill the 24/7/365 productivity objectives. In doing so, little thought was given to ICS network infrastructure, because the networks were simple and straightforward. In the past five to 10 years, the proliferation of inclusive connectivity in ICS environments has outpaced the changes to design and operations. As a result, many critical infrastructure organizations haven’t fully kept pace with the rate and significance of changes to their systems, and vulnerabilities have emerged that are highly available to exploit. How Sophia can detect potential threats that attempt to disrupt your control systems. NexDefense helps organizations across critical infrastructure sectors to identify threats, reduce risks and better maintain the availability, integrity and confidentiality of all essential operations. Sophia™, the company’s patent-pending Industrial Network Security Monitoring system, is a cybersecurity solution purpose-built for control systems to enhance protection while also facilitating compliance to standards and best practices. Sophia understands ICS protocols and provides real-time insight into systems to give organizations visibility and access to the data they need to know to make real-time decisions and better protect critical infrastructure from cyber attacks. For more information on NexDefense, visit http://www.nexdefense.com and follow us on Twitter @nexdefense. Download all of our whitepapers at http://www.nexdefense.com/learn-more/white-papers/. NexDefense empowers industrial control system operators with the real-time knowledge needed to maintain system integrity and combat sophisticated cybersecurity threats. Through Sophia™, a patent-pending industrial network monitoring and anomaly detection system, control system engineers, operators and security practitioners can gain valuable insight into networking events and activities that can negatively affect vital process and manufacturing systems. When employed throughout the control system’s lifecycle, its proven capacity to continuously identify, analyze and warn about deviations from normal operations provides unparalleled situational awareness and actionable intelligence to limit risk, reduce liabilities and enhance control system safety, security and productivity. For more information on NexDefense, visit http://www.nexdefense.com and follow us @NexDefense.